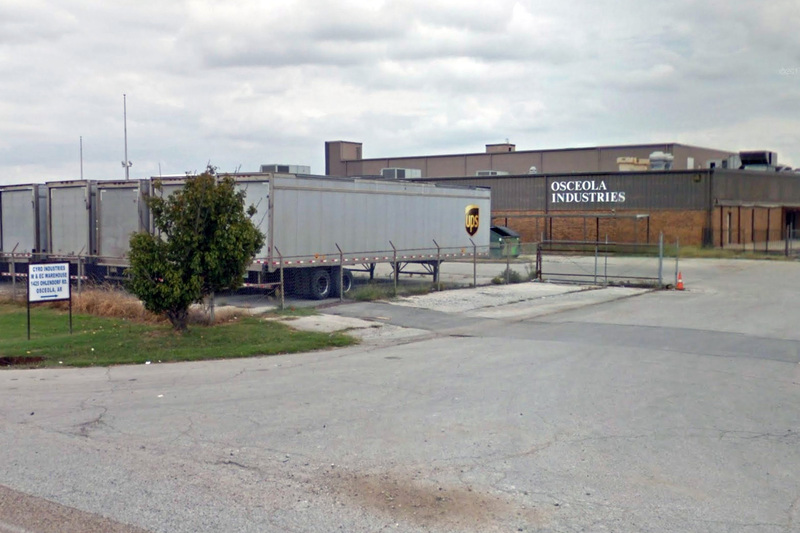 The city of Osceola is hoping to find an attractive offer for a vacant industrial property when sealed bids are opened Thursday morning. The 586,948-SF Osceola Industries property, former home to Fruit of the Loom’s fleecewear plant, has had a number of prospective buyers visit the site. The city is hoping the property’s proximity to transportation infrastructure plus a lack of accessible warehouse space in the area will drive a buyer’s interest. Wilson couldn’t comment on specific parties but said at least three entities have shown an interest in purchasing the facility. The parties who have visited the site have expressed interest in leasing it as warehouse space, Wilson said. A deal would have to include the shuttered plant for e-waste recycler BlueOak, located near the Osceola Industries property on Ohlendorf Road. Wilson said that could be a possible complicating factor. “That may come into play in whether or not the city is going to be able to sell it,” she said. The sale of the Osceola Industries facility wouldn’t mean a major spike in job growth for the community Wilson said, but it would relieve the city of responsibility for the property while providing needed, local storage space. A company like Osceola-based Big River Steel, which last year announced a $1.2 billion expansion, could possibly be one of the nearby entities with a storage need, Wilson said. “With our boom in the steel industry here I think that it would be a real benefit for any business, someone who’s in the business of managing warehouse space,” Wilson said. Wilson noted the lack of available warehouses in nearby communities like Jonesboro and Memphis and acknowledged the effect of the “Just In Time” concept of raw materials inventory management, a type of lean methodology in which goods are received only as needed for a specific project. While the Just In Time concept may increase efficiency and reduce the cost of inventory, it isn’t always applicable to companies who need someplace to store raw materials in great quantity, Wilson said. When it comes to shipping raw materials, the Osceola Industries building has the added attraction of being wedged between Interstate 55 and the Mississippi River, whose port is in close proximity, Wilson said. Plus the Burlington Northern Railroad main line, with a switch and a spur line, borders the property. The Osceola Industries property, at 1425 Ohlendorf Road, was built in 1959 and saw its last major renovation, with asbestos removal, in 1989. It has been mostly vacant since Fruit of the Loom shut down in 2000-2001. There are 75 acres of adjoining property, plus an 11-acre pond site, and the building features rail doors, truck wells and doors and dock doors. Osceola was designated one of the state’s Opportunity Zones created by the 2017 Tax Cuts and Jobs Act. The zones are economically distressed communities where new investments might be eligible for preferential tax treatment under certain conditions. “I hope that a potential buyer would be thinking about that,” Wilson said.